While we consider the fate of our country’s faltering economy, the national conversation has been rich with voices extolling the virtues of buying local. Farmer’s Markets have been lauded with relish over national airwaves and recent reports have shown that while Starbucks is suffering, local cafes are actually doing more business. 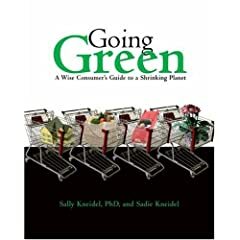 As a result, we can safely say that among foodies, eco-minded individuals and the budget conscious (to name just a few) the buy local movement and with it, the local-versus-organic debate, is alive and thriving. This time though, it doesn’t stop at the kitchen. In fact, the local vs. organic face-off may soon be appearing in a closet near you. More and more companies, like North Carolina-based TS Designs, are looking local—to benefit regional economies, decrease their carbon footprint, and steer clear of potential human rights abuses. This month, the company which usually retails organic cotton apparel, launched a new line of T-shirts grown, made, and sold in the Carolinas. President of TS Designs, Eric Henry, is excited about the opportunity to provide consumers with locally grown cotton clothes. And in North Carolina, whose textile industry has been in steady decline for decades- losing business primarily to overseas manufacturers- it’s a hopeful sign. Speaking with Henry, you’ll realize in seconds—he knows what he’s talking about and he’s ready to share it with you. He casually hops from talk about NAFTA to the Slow Food Movement, to his hopes for the new brand. One such hope is bringing the farm, factory and consumer closer together. The shirts will travel about 700 miles (compared with up to 17,000 miles for a conventional garment) and that means a lot to him. “I know all the people involved,” he explains, “I can get in my car, or you can get in your car and within one day you can touch everybody that’s involved in the process.” That’s a lot more than I can claim for the clothes I’m wearing today. After a quick review of tags, I’ve got on clothes from Turkey, Cambodia, China, and Egypt—and I’m starting to feel pretty guilty. But before you torch the contents of your closet in favor of exclusively local attire, it’s important to remember it’s not all a bed of locally cultivated, organic, heirloom roses. Actually, it’s not organic at all. So, much like the conversations many of us have had about locally grown versus organic foods, when the debate enters the closet it’s just that—a debate. We live in a time where almost anything we buy has participated in a supply chain that reaches farther geographically than the average American has ever traveled. It’s up to the consumer to pick. Whether you opt for organic socks that hail from Burundi or locally produced ones that grow from genetically modified seed, participating in the conversation does make a difference. Indeed, TS Designs plans to research the feasibility of organic and local cotton for future years. It’s just further proof that adding more voices to the conversation can yield positive results. 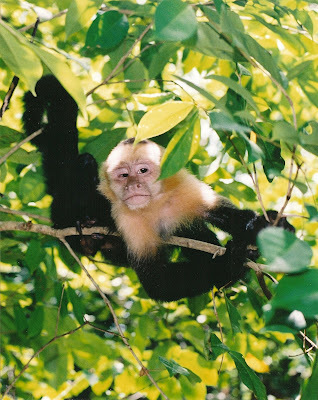 The first monkeys I ever saw in the wild were white-faced capuchins in Costa Rica. Or maybe black howlers were first. But the capuchins were much more charming than the howlers. I fell in love with them. We were on the beach at Manuel Antonio Parque Nacional the first time, and my son Alan had a banana in his pocket. The capuchins were interested in us because of the banana, and they had no fear. The howlers and spider monkeys and squirrel monkeys will stay up in the trees, far away from you, no matter what you have or do. But the capuchins come right down. They even ran out on the beach and snatched things from people's picnic baskets. The capuchins, with their human-like faces and hands, sat in the trees eating bags of crackers and throwing the cellophane wrappers down. As a biologist, I know that's not a good thing at all. But yet, I could see myself in the capuchins. I also do what I'm not supposed to do, eat things I know aren't good for me, make choices that endanger my well-being. We were tempted to give the capuchins the banana, but we didn't. We didn't give them anything to eat, we knew better than that. Monkeys that eat human food get sick eventually from malnutrition. But the next day, we asked the ranger what time the troop of capuchins usually moved through the trees over the beach, on their daily foraging rounds. Our Spanish communication wasn't precise, but he told us and we got the idea. We waited for the monkeys. They came. And they were mad that Alan and I were standing under the trees while they were cavorting from branch to branch, just overhead. 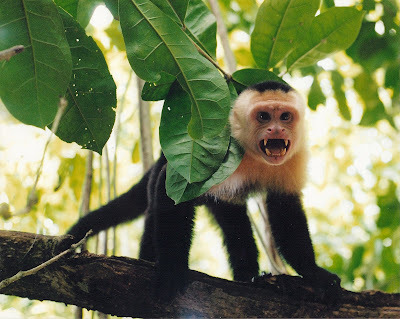 The head honcho, a male capuchin, came down and bared his teeth at us and shook the branches to frighten us. We trembled with delight instead.... the pleasure of recalling it even now makes my heart beat fast. We took his photo while he railed at us, infuriated. I was sorry to distress him, but I couldn't help it. Monkeys are territorial, they get angry just like anyone whose space is invaded. It wouldn't hurt him to bare his teeth and shake a few branches. His social stature with his troop may have benefitted from the display. The capuchin was angry that we were standing under the trees in his foraging route. 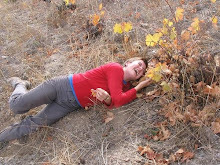 He bared his teeth aggressively. Anyway, I started this post to write about a news story that just came out about capuchins. Capuchins used to be "organ grinder" monkeys. These days they're sometimes trained as "helping hand" monkeys for people with paraplegia or quadriplegia. They're very smart monkeys. This recent piece of research shows that capuchins in Brazil are adept at tool use - an ability that used to be attributed only to humans but has now been demonstrated by numerous species from birds to apes. The capuchins use stones to crack open hard-shelled nuts. But the research goes far beyond just demonstrating tool use. The capuchins don't just grab the nearest rock at hand. They select the best tool for the job. Primatologist Elisabetta Visalberghi of the Institute of Cognitive Sciences and Technologies in Rome has shown that these monkeys draw on knowledge of a variety of nuts and stones to select the most effective implement. She studied the monkeys in the wild and observed that they generally approached two or three stones that differed in hardness, size, or weight. In nearly every case, the monkeys chose the most appropriate stone. "The present findings make capuchins a compelling model to track the evolutionary roots of stone-tool use," says Visalberghi. Because capuchins shared a common ancestor with humans 35 million years ago, Visalberghi feels that their behavior may demonstrate that the capacity for tool use evoloved earlier than thought. But primatologist Frans de Waal of Emory University has a different interpretation. He says the work highlights the monkeys' capacity for trial-and-error learning, that planning may not have been a part of their tool preferences. The monkeys may be simply applying life lessons about the success of various stones at cracking nuts. Whether their discriminatory skills are the result of planning or of learning, they're still a step beyond simple tool use. They demonstrate in a non-human animal the ability to select and apply an appropriate tool for a particular job. We humans are not so unique after all. Do we really deserve to claim the whole planet all for ourselves and crowd out every other species of animal, leaving only the pest species, the livestock, and the companion species? I hope not. I hope the capuchins will always be alive and well in Costa Rica and Brazil, not displaced by cattle pastures. Bruce Bower. Monkeys pick the right rock. Science News. February 14, 2009. 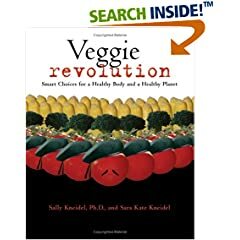 Sally often says, when speaking to others about the impact of eating less meat, that what you eat is more important than what you drive. The UN document "Livestock's Long Shadow" says that our diet choices impact climate change more than transportation. I shared that with my Biology class and sensed some disbelief, so I decided to use www.myfootprint.org, a website where you can caluclate your ecological footprint, as a way to convince them that this is true. Your footprint tells you how many worlds it would take to support the human population if everyone in the world lived just like you. I worked through the footprint questions, choosing all of the default or "average" values as answers. The only answer that I intentially set away from the average, was my diet. First, I chose "top of the food chain - I eat meat, seafood, or dairy at almost every meal" as a description of what I eat. This trial resulted in a footprint of 7.04 worlds. I then repeated the questionnaire, changing only one thing - my diet from "top of the food chain" to "vegan". The footprint dropped to 5.24, a 26% reduction. Impressive! I then repeated the footprint two times. Both times I let my diet description stay at "omnivore", the default setting, so food choice didn't vary. What I did change was the car I drive. Both times I chose 20,000 miles as the amount that I drive each year, but in one run I chose a "truck or SUV" as my car (this resulted in 7.34 worlds), and the other I swtiched to a hybrid (resulting in 5.99 worlds). The reduction this time was 18%. Looks like the UN report is right! (Or, more likely, the footprint modelers used the report in writing their computer model.) I know I could have had my students read the report (it's on-line), but this was a much simpler way to get the point across. They had already calculated their footprint, so it was a result they could easily grasp. Most of the students had calculated their footprints to be in the 5-7 range. They were distressed and felt trapped a bit. As teenagers they couldn't easily change the house they live in or the cars their family drives. But they do have control over what they eat. 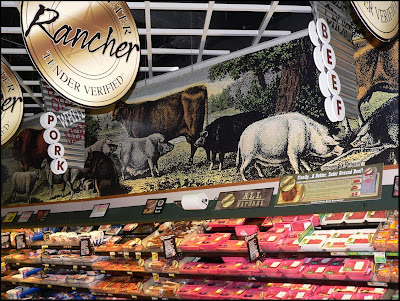 Eating less meat offers an easy way to lower one's environmental impact.